Russia’s finance minister made a rare admission of responsibility Monday for the country’s severe economic crisis. The Russian government overspent its vast oil revenues in recent years, fueling inflation, and did not do enough to reduce the economy’s reliance on oil, Finance Minister Alexei Kudrin said in an exclusive CNN interview. 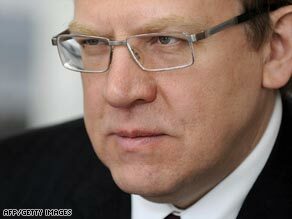 “Of course, I too bear the responsibility for not managing to diversify the economy as much as we wanted,” Kudrin said. “We were spending more money than we could afford, which is why we had a rapid strengthening of the national currency [and] a high inflation rate. “I think the government should have been more conservative in its financial policy and save more money that it received from the high global oil prices,” he said. Kremlin officials usually blame the West, and specifically the United States, for the global economic crisis. Kudrin, who is also a deputy prime minister, said the financial crisis had set back the Russian economy by five years — but added that the United States had fared even worse. “We only retreated back five years,” he said. “As far as I know, U.S. stock markets have fallen back 10 years.” Watch CNN’s exclusive interview with Russia’s finance minister » The Dow Jones index of leading shares hit lows not seen since 1997 on Monday. Kudrin confirmed Russia would have a budget deficit of 8 percent in 2009 — its first for a decade — and will spend more than it takes in for the next two years as well. He predicted a deficit of 5 percent in 2010 and 3 percent in 2011. Russian government budget forecasts assumed oil would cost $95 a barrel — more than twice as much as it costs at the moment. The lower price hurt Russia, one of the world’s largest oil exporters. But Kudrin said Moscow would not cut spending, though it would change its priorities. “In general, the volume of spending will remain the same, and even slightly increase, which is why the deficit will go up to 8 percent,” he said. “We need to optimize our spending and cut certain programs,” he added. “First of all, we halted all brand new programs and all new projects. In some cases we’ve also cut government institutions and government employees’ payroll. Besides, we’ve decreased funding for less important projects by 50 percent and more. But by and large social spending and important infrastructure projects remain untouched.” Russia’s stock markets plummeted by nearly 70 percent in 2008, and the country spent one-third of its gold and foreign currency reserves — or $216 billion — defending its currency, the ruble. The Kremlin has also committed vast sums to bail out big business in Russia, which is heavily in debt to foreign banks. Kudrin — who is attending a global investment forum in Moscow — said there were signs the Russian economy was stabilizing. He confirmed that investors pulled $40 billion out of Russia in January, but said that enormous outflows of cash had stopped.